THE Melbourne Cup is the pinnacle of Australian horse racing and a great field of 24 runners will take their place at Flemington on Tuesday. Sorting through the big field can be a mission, so we’ve compiled a betting guide of every runner which includes horse details, form, odds and free tips. 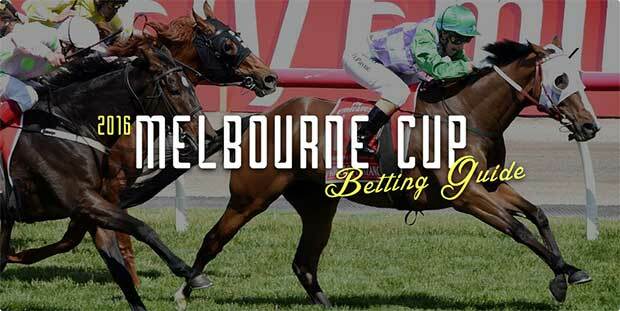 Everyone loves a punt in the Melbourne Cup so why not get some added information to make the selection process easier. CrownBet is also making things easier and more profitable by giving new punters 100% up to $1000 in bonus bets if you sign up before the Melbourne Cup runs. Punters can use their bonus bets on the 2016 Melbourne Cup so get take advantage of this amazing offer. Most of the post-barrier draw money has come for Lexus Stakes winner Oceanographer. The European-trainer runner opened at $151 in the early markets so there are some punters getting incredible value, but the $6.50 on offer might be an overreaction to its win on Saturday. 2016 Caulfield Cup winner Jameka drifted immediately out to $8 following Saturday’s action at Caulfield. The Ciaron Maher-trained mare was as short as $5.50 throughout the week and that price was considered fair, so it’s best to lock in the $8 now if Jameka if your desired runner. Almost every runner has drifted in the market over the last 12 hours. Big Orange firmed in from $16 to $15 at CrownBet.com.au, but all of the long-shot chances have shifted out in the betting. That’s to be expected as the favourites will attract plenty of attention which means punters are getting amazing odds for some quality thoroughbreds. Experience in the Melbourne Cup can be key for the international runners and Big Orange was far from disgraced when fifth in last year’s Cup. The five-year-old made the best of a roughly-run race last year and its form since has indicated that it has only improved with time. It comes into this having won its last two starts in Europe with its last start coming over 3218m in the Goodwood Cup where it carried 61kg. It drops to 57kg which made the connections happy and trainer Michael Bell was satisfied with how it has been handicapped. “He’s a big horse and the fact he has top weight is probably not so relevant given his physique,” Bell said. “We wanted to come, but we just waited to see what weight we were allotted, and when we were given half a kilo more than last year we were committed to it. It all bodes well for Big Orange and we’re expecting the $15 at CrownBet.com.au to shorten. Our Ivanhowe isn’t a horse that likes to win often, but it likes to save its best efforts for the big races. The seven-year-old has had three runs this preparation with its best finish coming in the Group 1 Makybe Diva where it ran fifth behind Palentino. It didn’t show up in the Group 1 Turnbull, but it was making late ground in the Caulfield Cup and that’s what punters would have wanted to see. It finished 10th in the Melbourne Cup last year and connections should be confident that it can better that effort. The $41 is about where it should be in the market, but that’s a nice price for a Doomben Cup winner of last season. Weighing up the Japanese form is usually cut and dry, but this nine-year-old is very inconsistent and that worries us. The son of Heart’s Cry hasn’t performed well at all this season with its best finish coming at Kyoto in May, but that inconsistency puts fear into the mind of the punter and the $26 represents that it has a winning chance. It would have to become the first nine-year-old to win the Melbourne Cup and better Japanese horses have tried and failed, so we’re not going to tip Curren Mirotic from the wide draw and it just looks too tough of a task. Bondi Beach is one of the best-rated European horses in the Melbourne Cup and it’s not hard to see why. The four-year-old son of Galileo not only has staying breeding on its side, but it has experience in the Cup and although it wasn’t a happy outing, it didn’t have much luck. Bondi Beach was one of many runners taken out by Frankie Dettori, so overlook its run for 16th last year and go on its form since. It won back-to-back races in Ireland following its run at Flemington and despite only running third at its last two outings, that form could be good enough for this. Exospheric showed what it’s capable of when running third in the Caulfield Cup behind Jameka. It was the European imports first run in Australia and it should improve with the experience under its belt. Champion jockey Damien Oliver returns from a suspension to ride the five-year-old and it gives the Freedman’s a two-pronged attack this year. It has drifted from $15 to $17 in the betting, but it strikes us as a horse which will be in the thick of the finish and there’s no reason to leave it out of calculations. It won the Jockey Club Stakes at Newmarket by four lengths in April and although it was three lengths behind Big Orange in the Princess Of Wales’s Stakes in July, it could turn the tables over the extreme staying distance. Hartnell has been a well-supported commodity since winning the Group 1 Turnbull Stakes by over three lengths. It defeated subsequent Caulfield Cup winner Jameka by over three lengths and that form looks to be one of the strongest form lines coming into the Melbourne Cup. It ran second behind Winx in the Cox Plate and even though it finished eight lengths behind the champion mare, it didn’t give up in the straight and it was a nice hit-out before the Cup. Trainer John O’Shea believes that form justifies its favouritism tag. Hartnell’s biggest attribute is its ability to settle during the run. To win the Melbourne Cup requires horses to settle throughout and with the solid cruising speed that Hartnell possesses, it will likely be presented in the straight with a chance to win. We wouldn’t take anything shorter than its current price, but the $5 at CrownBet is a fair bet. Punters should never rule out Who Shot Thebarman as it’s a proven winner at 3200m and its run for second in the Moonee Valley Cup was a great lead-in for this. The Chris Waller-trained gelding only gets warm over the extreme staying distances and having had six starts at the two miles, it brings a load of experience to Flemington. It has one win and two placings from those six starts at the 3200m and with plenty of racing under its belt this year, it bodes well for its grand final. Jockey Hugh Bowman is coming off a Group one double at Flemington on Derby Day and his confidence is sky high. Look for Bowman to drop back from the wide barrier and allow the eight-year-old to search wide around the home turn before sustaining a solid sprint. $41 at Bet365.com is overs for this tried-and-tested two miler. Wicklow Brave’s chances were dealt a blow when it drew barrier 24, but Willie Mullins knows it takes fair bit of luck to win the Melbourne Cup. The seven-year-old is a classic Mullins-trained gelding which has form on both the flat and over hurdles. That formula worked well last year for Mullins who lined up Max Dynamite which finished second in the 2015 Melbourne Cup. Running over hurdles gives them good experience over the staying distances, but its most recent form on the flat has been outstanding. It won the Irish St Leger with 62kg on its back last start at Curragh, beating Order Of St George by a half-length. It has improved nicely since running fourth behind Big Orange in the Goodwood Cup and if it can find some cover from barrier 24, it will there at the end. Having had 15 runs over 3200m for six wins and three placings is a big bonus and punters should have something on the $21 for the win and $6 to place at Sportsbet. Almoonqith was struggling to find form in its first three starts this campaign, but it burst into Melbourne Cup calculations by running fourth in the Caulfield Cup at odds of $71. The Hayes/Dabernig-trained horse runs its best over two miles and if there’s a strong pace up front, it could have one shot at them late. David Hayes isn’t worried about the wide draw and notes just how good its Caulfield Cup run was. “I’d rather draw out in the Melbourne Cup. I think Flemington by race 15 of the carnival, three wide with cover is where you want to be,” Hayes said. There was plenty to like about its run last start, but we would want more value than $26. Gallante ran in the Moonee Valley Cup as a $3.80 favourite, but failed to make any impression after being taken on in front. Co-owner Nick Williams has said to forgive that effort as nothing went to plan and punters are getting some terrific value in this. The $67 at Sportsbet is a great each way price for a Lloyd Williams-owned gelding which finished second behind Jameka in the Naturalism fresh up. It won its only start at two miles when winning the Group 1 Sydney Cup at Randwick and if there’s a bit of moisture in the Flemington surface, which there typically is, then Gallante comes right into calculations. Grand Marshal is a true staying type which scored a long-overdue win in the Moonee Valley Cup last start. The Chris Waller-trained gelding won narrowly over stablemate Who Shot Thebarman and the run will be a nice preparation for this coming Tuesday. It has had four starts at 3200m for one win and two placings. It has experience in the Melbourne Cup and it was desperately unlucky last year and it would have finished a lot closer to them. It’s a seven-year-old which will get back in the run, but with some luck it could run in a top five position. Jameka couldn’t have been more impressive in winning the Caulfield Cup by three lengths over Scottish. The four-year-old mare has improved significantly this season and its only defeat came at the hands of Hartnell in the Turnbull Stakes. It has now had 19 starts for five wins and eight placings, and with two wins under its belt at Flemington, it knows the surface well. It drifted from $5.50 to $8 at CrownBet following the barrier draw, but there’s nothing wrong with drawing barrier three and Nick Hall will surely put the mare into a forward position. Whether it can turn the tables on Hartnell and defeat a talented lot of Europeans, that’s the big question, but it’s in great form and there will be plenty of interest on race day. Winners of the Ebor Handicap often step up well on the big stage and Heartbreak City comes into this having won the Ebor by four lengths. Trained by Tony Martin, the seven-year-old is another entrant with hurdle form and both of its recent hurdle wins came over this distance. It’s a tactic that seemingly works in preparation for the Melbourne Cup and its win in the Ebor has classy. It received no favours in the barrier when barrier 23 was selected, but that’s offset by having champion jockey Joao Moreira in the saddle and he can work his magic. It’s an interesting runner and the $15 suggests it has a solid winning chance. We can’t tip it to run in the first three, but its form must be respected and a top-10 finish looks highly likely. Sir John Hawkwood was one of the most consistent staying types in Australia and it showed its true ability when winning the Group 1 Metropolitan Handicap at Randwick, but it didn’t adapt to racing left handed last start. The eight-year-old finished 10th in the Caulfield Cup and it never threatened. It rises in weight for this which isn’t ideal and although it has been a profitable bet for us over the past few seasons, this looks a stretch too far. We were confident this Waterhouse/Bott stayer would notch a win during the Melbourne spring carnival, but it appears as though the Melbourne Cup is its last chance. The son of Monsun finished third in the Bart Cummings at Flemington two starts back which was an encouraging effort and it wasn’t too far behind Grand Marshal last start. It ran super in the Melbourne Cup last year, but a repeat of that effort looks unlikely on what we’ve seen this campaign. Barrier 21 adds to the pain and if it does upset them and win at odds of $67, we’re hoping a few punters stay loyal to it, but we can’t. The Godolphin runner secured the inside draw and that will give it a soft run throughout. The New Approach mare has solid form this campaign which included a win in the Middleton Stakes at York in May, but it hasn’t been overly impressive since. The five-year-old finished 11 lengths behind the winner in the Hardwicke Stakes at Ascot before running almost 20 lengths behind the winner at Goodwood. That form won’t cut it in a Melbourne Cup and despite being from the powerful Godolphin stable, this is unlikely to be their first Cup winner. One of the better each way bets of the 2016 Melbourne Cup, Almandin looked the goods when winning the Harry White Stakes at Caulfield and it franked that form by winning the Bart Cummings at Flemington last start. The Team Williams-owned gelding won the Bart Cummings with ease and that should be a strong form race for the Cup this year. It hit the lead with 300m to go and never looked like getting run down. The concern is whether it will see out the distance, but the German-bred horses have already made their mark on the Melbourne Cup (Protectionist) and Almandin has all the right credentials to add to the winners list. Assign is probably the weakest of the four Macedon Lodge runners, but it does come into the Cup having won at its last start. The well-bred son of Montjeu won the Herbert Power in early October, but the form out of that race is suspect and it only defeated a field of six runners. It has yet to feature in three starts at Flemington and it has drawn wide in barrier 22, so a win does look unlikely. Katelyn Mallyon is looking to win back-to-back Melbourne Cups for the female jockeys and it will carry some sentimental support, but we can’t have it here. Grey Lion finished second in the Geelong Cup behind Qewy and it beat home Oceanographer which subsequently won the Lexus Stakes. Given the price difference between Oceanographer ($6.50) and Grey Lion, punters could be drawn to the $41 on offer at William Hill and we wouldn’t go against those thoughts. It battled on well at Geelong although its form prior to that was suspect, it has the breeding to run two miles. It also has Glen Boss in the saddle who famously won three-consecutive Melbourne Cups with Makybe Diva and that experience will help. Drawing barrier 16 won’t help, but Cumani is seeing the positive side to it. “Wider than we had hoped, but we got good horses either side, good pace. Qewy on the inside and Curren Mirotic on our outside, so it could have been a lot worse,” Cumani said. “I think it’s about having options, the further out you are the easier it is to see where you’re going, it’s up to Boss now to find his route and go for home when the time is right. Oceanographer had its first run in Australia when finishing third in the Geelong Cup and punters got excited about that effort, but they were even more pleased when it won the Group 3 Lexus Stakes on Saturday in impressive fashion. The five-year-old settled back in the field and gave leader Tom Melbourne a big start into the straight, but the son of Sea The Stars sprinted late to reel in Tom Melbourne and record a mighty win at Flemington. That run caught the bookmakers attention and they immediately cut its Melbourne Cup price to $6.50 where it currently stands. Chad Schofield rides at 52kg and he has shown ability to win on the big stage, and jumping from barrier 11 should see it settle closer to the pace. The positive to betting on Secret Number is that it’s a consistent horse which brings winning form into the Melbourne Cup. The Godolphin gelding won the Doonside Cup last start and although it’s not the greatest form guide for a Melbourne Cup, it has Australian form which is strong. It finished second in the 2015 Queen Elizabeth at Flemington behind Dandino and despite having had only one run since, that form should shape up well. It’s a mystery runner which could show up at big odds, but there’s too much risk involved. Pentathlon is a $101 chance for a reason, but it gave long-shot punters hope when it finished third in the Moonee Valley Cup. Its subsequent run for seventh in the Lexus Stakes wasn’t up to this quality and we would be very surprised if the New Zealand runner figured in the placings. Couldn’t have done much more than win the Geelong Cup by beating Grey Lion and Oceanographer and it’s paying nice odds for this. The Street Cry gelding might not have the best form prior to the Geelong Cup, but it drops in weight to 51.5kg and Craig Williams takes the ride. It has placed in all three career starts at 3200m and it might go under the radar of punters on race day. The $34 at Bet365 is a good price and it should give punters a sight. Former New Zealand runner which finished second in the Auckland Cup over two miles. Since arriving in Australia in a new stable it hasn’t been able to show any form and the odds are indicative of its ability. We doubt there will be two triple-figure winners in consecutive years. It’s tough to go past Hartnell based on what it has done so far this season. The John O’Shea-trained runner scored three consecutive wins before being beaten by Winx in the Cox Plate, but take nothing away from that run and with some luck in the running, it should figure in the finish. The $5 is a good price and we’re expecting that to drop on race day. We have two internationals to fill out the placings. Big Orange has Melbourne Cup experience and it has strengthened up nicely since last year. It has the ability to sit on the speed and produce a strong kick in the straight, so it will be the biggest danger to Hartnell. Big Orange is paying $5 to place at Sportsbet which is great value. Oceanographer goes into calculations following its impressive Lexus Stakes win and Almandin has been a personal favourite since it won the Bart Cummings in fine style.